Global Body and Equipment has two robotic welders. The larger is a Miller CP200. It has two material positioners so that we can weld a different assembly on each side. The parts are tacked to together in a fixture manually while the robot is welding another part. The tacked together part is placed onto a holding fixture to ensure the welds are placed precisely where they need to be. Global Body also has an OTS Robotic welder. 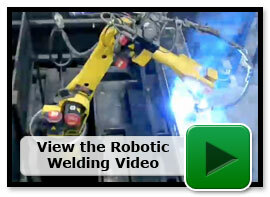 This welder has a rotating table that positions the parts in front of the robot. 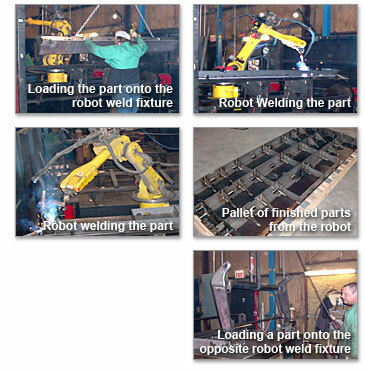 The pictures below show a welder placing parts into the fixture and clamping them into place. The table rotates so the robot can weld the parts. 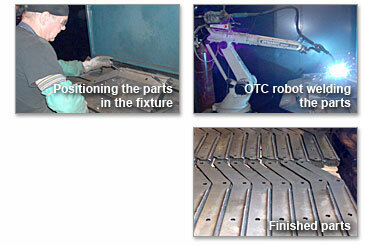 The operator side of the table can then be loaded with additional parts as the robot is welding on the opposite side. Get in touch with a Pro. One of our engineers will discuss your needs and design a quote around your custom specifications. "Our engineer was professional, knowledgeable, and most importantly efficient in the services we needed. He kept our minds at ease by providing us with timely updates and answering our questions promptly and accurately. He was a joy to work with and I intend to continue to use CNC Metal Products for our upcoming projects."